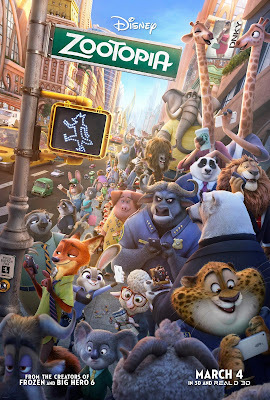 Zootopia was a fun, animated whodunnit that made up for its predictability with its relevance: a gorgeous new-world that aptly parallels the real world and bolstered by a great chemistry between the leads: Ginnifer Goodwin & Jason Bateman. The story, albeit unoriginal, deserved praise for veering left instead of keeping it straight in the Third Act which was mildly unexpected. The world building was done seamlessly in the exposition and was introduced with as much awe and wonder to us as to the lead bunny. The script was equally accessible to junior as it was layered for the adult which made it slightly more enjoyable. Who doesn't like a gag about Breaking Bad? And it sure was fun spotting all the in-jokes and easter eggs which were thankfully not as distracting as Marvel's. But on a more serious note, the themes were surprisingly heavy and relevant to our society now and hopefully the subversive message can be translated and absorbed into the younger generation. Goodwin and Bateman had great voice chemistry and their relationship formed the core of the story that helped to maintain the pacing and tempo. The music by Michael Giacchino definitely helped too but it was less distinctive than his past works. Running at a brisk 109 minutes, this was a fun way to idle away some time, and I suspect it would have been great in 3D too.